Air bouncing is great fun, promotes fitness and can be enjoyed by all ages. 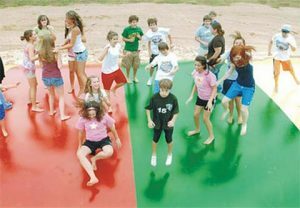 The jumping platform is at a lower level than more traditional type bouncing – jumping play equipment thus increasing its safety features. These leisure products are well established and hugely successful in recreation centers in the United States and Australia. Air Bouncers Ltd. is an Irish company based in County Galway. The team is headed up by Austin Gohery. Austin, an electrical contractor by trade, first came across air bouncers in the US and loved this leisure product. Austin’s experience led him to set up Air Bouncers Ltd. 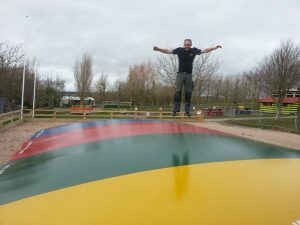 The company supplies and installs Air Bouncers in the UK and Ireland. Driven by a vision of “fun with safety”, the company prides itself on the quality of its product (5 year warranty) and the efficiency of its installation and back up service. The company has installed outdoor and indoor Air Bouncers in the UK. Take a look at the images gallery. Air Bouncers are suitable for a wide range of venues, such as family orientated leisure sites, play centres, caravan parks, open farms etc. So if you are in the leisure business and would like to increase your revenue by offering new and repeat visitors a new and fun experience, do contact us to find out more about Air Bouncers.